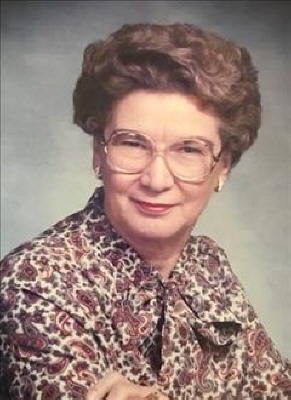 Mildred Louise Perkins, retired executive secretary, passed from this life on Saturday, March 30, 2019 at St. Dominic Memorial Hospital in Jackson, Mississippi at the age of 94. Mildred "Mimi" was born in Yalobusha County, Mississippi on July 13, 1924, to Sidney Hayden Perkins and Laura Weaver Perkins. She retired from Mississippi Valley Gas after 30 plus years of service and was an active member of the First Baptist Church of Jackson for many years. Mildred was preceded in death by her parents, Sidney Hayden Perkins and Laura Weaver Perkins, three sisters: Mary Elizabeth Perkins, Lucille Hayden Perkins, Eva Perkins Coleman, and five brothers: Herbert Perkins, Sidney Perkins, Davis Perkins, Charles E. Perkins, and Samuel Perkins. Mildred Louise Perkins is survived by her nephew, Jack Perkins (Lela) of Madison, Mississippi, whom she raised and nurtured like a son. She is also survived by a host of nieces and nephews, great nieces and nephews, and great-great nieces and nephews. Pallbearers will be Hayden Perkins, Ashton Perkins, John Seton Perkins, Jeff Perkins, Dave Perkins, Bill Coleman, and Alan Tucker. Visitation will be held at Mortimer Funeral Home, Belzoni, Mississippi, on Tuesday April 2, 2019 from 10:30 a.m. to 11:30 a.m. Funeral services will be held immediately following visitation in the Chapel with Sidney L. (Larry) Perkins, DMin, officiating. Burial will be at Greenfield Cemetery in Glen Allen. In lieu of flowers, memorials may be made to the First Baptist Church, Jackson Mississippi or to St. Joseph's Hospice of Clinton, Mississippi. Mortimer Funeral Home of Belzoni has been entrusted with the arrangements. To plant a tree in memory of Mildred Louise Perkins, please visit our Tribute Store. "Email Address" would like to share the life celebration of Mildred Louise Perkins. Click on the "link" to go to share a favorite memory or leave a condolence message for the family.